The things I don't know about pregnancy and childbirth are, again, catching up with me. I say "again" because it was only a month ago that I had a preeclampsia freak out and decided that my approach to pregnancy know-how had to change. This morning's post (The Big Reveal) included a fabulous photo of a "sonogram wand". I had a good time making perverted jokes about its shape. Within a few hours of the post going live, I received one comment and a couple behind the scenes communications from friends and family: the sonogram wand photo isn't a sonogram wand photo. I guess my reliance on wikipedia and urbandictionary.com for hard facts is finally catching up with me. 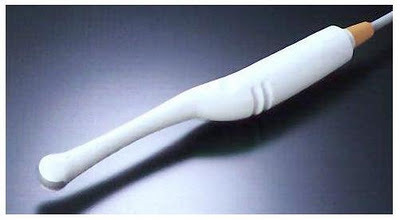 Turns out that the photo below is an internal sonogram wand. Not the one that is pressed against a pregnant belly to determine the unborn baby's gender. OOOPS! I haven't delved further into this discovery - I don't know when or why this internal sonogram wand is used - though I probably should given that its image is now posted twice on my blog. 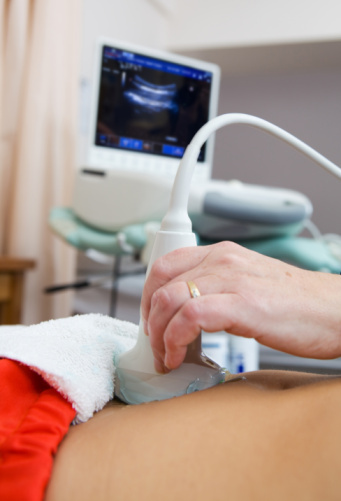 This photo shows the sonogram wand that is used to determine the baby's gender. Slightly less phallic shaped. The goop has a slight blue tint. Interesting. The internal wand is used for EARLY detection of baby. I had to have it used because I was only 7 weeks, and basically my uterus was still behind all the pelvic bones so we couldn't see anything with the external wand. That was the first and ONLY ultrasound I've ever had. I'm currently in my second pregnancy. Sam - Thanks for clarifying. In addition to not knowing the difference between an internal and external sonogram wand, I didn't realize you could forgo ultrasounds. Interesting. Congrats on your second pregnancy!